Click here for audio of Episode 865. Today, a determined city saves itself from extinction. The University of Houston's College of Engineering presents this series about the machines that make our civilization run, and the people whose ingenuity created them. We Houstonians like to run down to Galveston for seafood, for museums, or just to see ships and the Gulf. It's a nice town. Yet in 1900 Galveston's citizens seriously considered walking away from it -- letting it revert to a swamp. Many did leave. The Galveston storm was the worst natural disaster America ever suffered. Over 6000 people died. The way the city finally responded to that horror forms one of the great American legends. Galveston is a long island running west to east. It tilts slightly to the northeast. On the north is a protected harbor. The south side faces the Gulf of Mexico. The 19th-century city lay on the east end. Its highest point was nine feet above sea level. Its mean elevation was only five feet. The city was flooded repeatedly down through the 19th century. In 1886 a commission talked about building a wall against the sea, but they rejected the idea. It would cost too much. Now Galveston had seen just how bad a hurricane could be. Citizens knew they'd have to either give up their city or protect it. So by a ratio of 150 to 1 the people who could vote decided to undertake a wild engineering scheme. They would build a great dam, a Sea Wall along the south Gulf coast. It'd be 17 feet high and 3 miles long with a skirt of protective granite rip-rap. But the Sea Wall was a piece of cake compared to what followed. Next they raised the whole city. And this was the major city in Texas. They slanted the ground so water that got over the Sea Wall could run off toward the bay on the north. That meant raising the ground almost to the lip of the Wall. Then they sloped it downward to eight feet above sea level on the north. To do that, they cut a canal into the city and began pumping in a slurry of sand and salt water. The water ran off and left sand behind. Homeowners had to lift their houses up on stilts so the slurry could fill in under them. It took 300 jacks to lift the big brick Moody mansion. It took 700 jacks to lift St. Patrick's church. Of course there was a component of brutality in all that. Some homeowners couldn't afford the raising. Some had to sacrifice the bottom floor of their houses. Some had to abandon their homes entirely. The work went on in sections for seven years. In 1915 the new city they'd built suffered its first test. 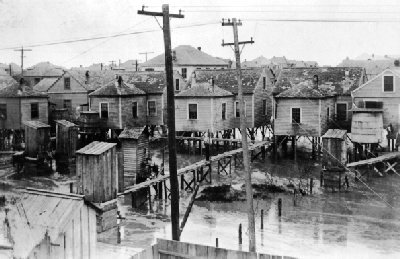 A storm every bit as bad as the 1900 hurricane hit Galveston and caused only eight deaths. Since then they've extended the Wall and filled in more land. No one at all died in hurricanes Carla and Alicia. And, today, the very presence of Galveston is one of the great joys of living in Texas. Walden, D., Raising Galveston. American Heritage of Invention & Technology , Winter 1990, pp. 8-18. I am grateful to Ellen Beasley, urban architectural historian, for her counsel on, and guided tours of, the raised city of Galveston. For an astonishing sidelight on the raising of Galvestion and for some additional images of the flood, see Episode 1099. Note added on Aug. 22, 2018: The first two sentences in the paragraph about jacking up buildings are in error. Moody Mansion was not raised, and the number of jacks used to raise St. Patrick's is too high.